The Linear End block of the Basic Line enables the glass block walls to be finished with the typical elegance of superior ranges of products. Ideal for creating flag type walls and for finishing dividing walls for interiors and exteriors, when the end part of the wall is not resting on the surrounding masonry. In the case of flag type walls the linear end block is used in association with the curved wall end block in the Basic Line. It is compatible with all the glass blocks in the Clear Line and with all the Coloured Basics, and must be installed with a minimum space of 1 cm. 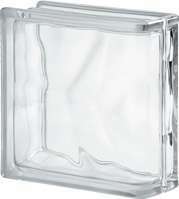 The Basic linear end block is available in neutral colour, wavy design and transparent finishing.